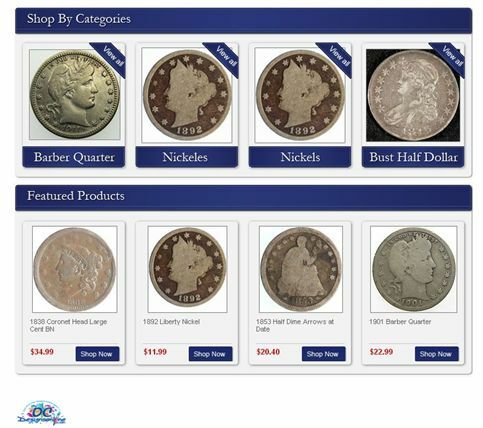 Home » Blog » The Happy Coin “Changes” eBay Store Design and It’s a Hit! The Happy Coin “Changes” eBay Store Design and It’s a Hit! If you’re a numismatist you love coin collecting—it’s what you do! 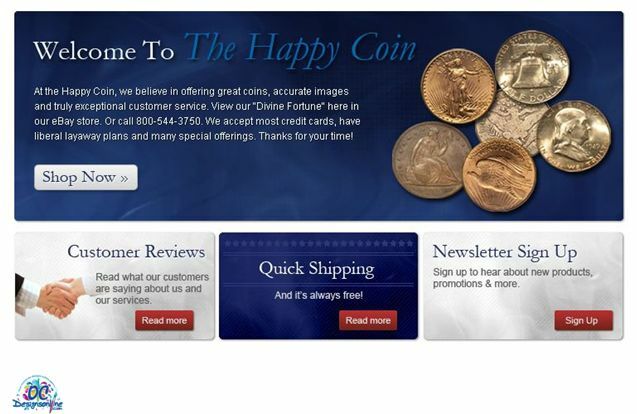 Recently, OC Designs Online was happy to help The Happy Coin get a fresh look with a great eBay store design. Some eBay stores sell a plethora of items from shoes to clothing to jewelry but when you focus on one thing and one thing only—coins—you need to stand out above the rest. For this eBay store design, we inserted in the “welcome” section why The Happy Coin is a good choice for coin shoppers; a statement about the company including how they offer a “liberal” layaway plan. Because some coins can range in the thousands of dollars, having a layaway plan is just one way The Happy Coin will reach its target market successfully. Underneath the welcome text we inserted three clickable boxes where buyers can read customer reviews, find out about their quick shipping and sign up for a free newsletter to stay on top of everything new at The Happy Coin. The top menu bar offers their logo, coin images and an easy to navigate tool bar which includes tabs where buyers can view all listings, leave and read feedback (a must for all eBay store designs) and contact the seller. Blues were implemented throughout this store design and we think the blue background helps showcase the coins clearly. On the side bar you can search the store for a particular product and shop by store categories. This is especially important for numismatists as they often search for particular coins so this easy side menu allows for this. We wrapped up this eBay store design with the types of payments The Happy Coin accepts and that they are PayPal verified and sneaked in one more logo on the bottom right. Specialty eBay stores need to have a great storefront in order to compete. We are pretty happy with the design we created for The Happy Coin—what do you think? Don’t forget to browse our eBay store design portfolio page and then contact us and we’ll be happy to turn your eBay store into some amazing!